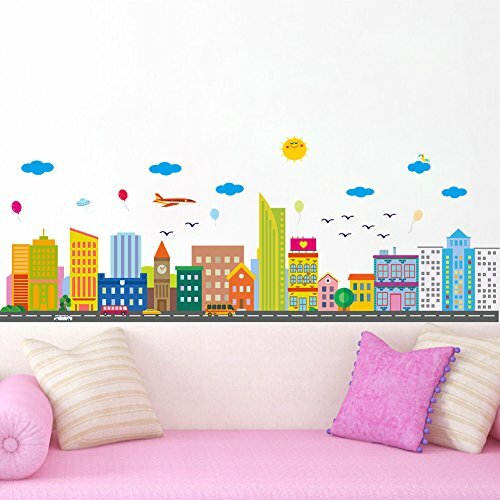 Wallpark wall sticker brings art into your room, and also brings joy to everyone, creating a home full of love, making your life more colorful and wonderful. After receiving the wall sticker, you could refer to the website picture effect, and also could challenge your creativity by making a little change. Please peel & apply it to any flat surfaces such as painted walls or ceiling, wallpaper, cupboard, furniture, glass, metal, or even in the bathroom, very easy to DIY! Size: comes in 1 sheet, sheet size: 50cm X 70cm; about 45cm X 120cm after applying. Features: stain resistant, mothproof, anti-mildew, practical and decorative. Instructions: Peel & stick, no paint, no tools and no hassle, instantly brighten up any space; Removable, repositionable with no harm to the surface; Not suitable for uneven, rough, textured surfaces. Use this at home, office, children's room, nursery, kitchen, and anywhere else within seconds. Easy to DIY! If you have any questions about this product by Wallpark, contact us by completing and submitting the form below. If you are looking for a specif part number, please include it with your message.